Phoenix Update, Sol 123: Press briefing with carbonates, clays, and snow! EDIT: I just got a couple of the graphs that they showed during today's briefing, which didn't make it on to the JPL or Arizona websites for some reason. They're included below. Using their lidar instrument, the meteorological team has detected snow falling from elevations of about 4 kilometers down to 2.5 kilometers, and it probably fell lower before sublimating. They said they'll be watching to see if any snow eventually reaches the ground. They had a neat graph of this data that hasn't made it to the mission websites yet. Watching snow fall on Mars! Cool. 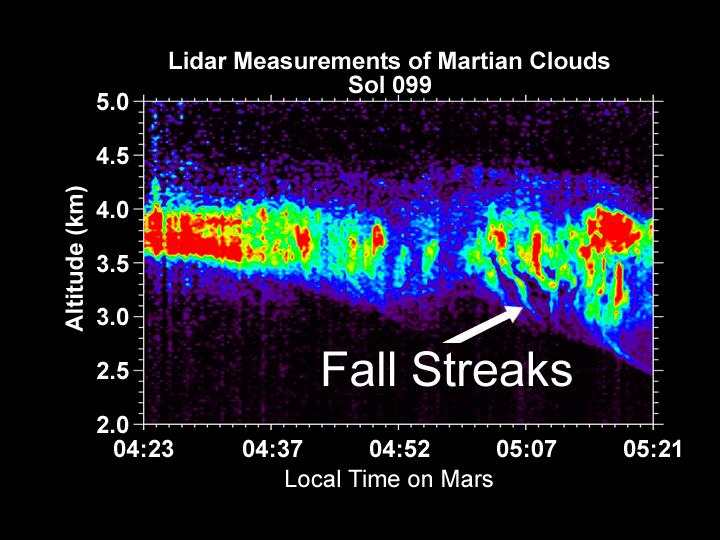 In the early morning hours of sol 99, Phoenix used its lidar (a skyward-pointing green laser beam) to search for clouds. The beam detected clouds at elevations between 3.5 and 4 kilometers above the surface. As the observation continued, it detected "fall streaks," where ice crystals that formed within the clouds began to descend toward the ground; as they descended, different wind speeds at different altitudes caused the sheets of falling snow crystals to shear out horizontally. When the lidar experiment quit operating at 05:21 local time, the crystals had fallen to an elevation of 2.5 kilometers, and probably fell further before they reached air that was dry enough to cause the crystals to sublimate back into a gas. Later in the season, the falling snow may survive all the way to the surface. Both of the two main analytical instruments, TEGA and MECA, have confirmed the presence of calcium carbonate (a.k.a. calcite) in their samples, relatively abundant at a few percent of the total soil mass. This is important because calcite is usually associated with liquid water. 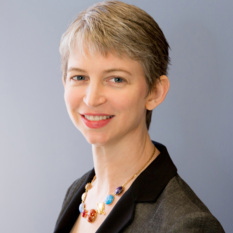 The TEGA team thinks they have also detected clay minerals, which isn't much of a surprise. MECA is unable to confirm this yet. This is also no surprise; MECA is designed to detect things that dissolve in water; calcite can dissolve fairly readily under the right conditions, while clays do not. The MECA team reported a firmer estimate of the soil pH as 8.3, which they said was very similar to the pH of Earth's oceans. The pH of Earth's oceans is actually buffered in part by feedback cycles among carbonate rocks and carbon dioxide in the atmosphere. If things get more acid, the oceans dissolve calcium carbonate, which, in turn, raises the pH, so the system winds up being pretty stable at that pH. The TEGA team has not yet detected organics. Further analysis of the data they already have on the ground could still yield that discovery, and there are still four ovens they haven't filled yet. If it's there, it's "not very much." Still, they are going ahead and performing a TEGA test using the "Organic-free blank" they brought from Earth, which will help them establish TEGA's detection limit. Despite several further attempts, they also still haven't gotten an ice sample into TEGA yet. They seem to be giving up on Snow White for now. They may try again, at a different location. They have to hurry to get samples into the remaining four ovens while power levels are still happy. Currently, Phoenix is expected to survive through most of November. If, by some miracle, it survives the coming Martian winter (during which it will spend hundreds of sols encased in carbon dioxide ice), it is programmed with a "Lazarus mode" to phone home once its batteries are charged enough. Although sunlight will return to the Phoenix site by mid-April, if it does survive, and assuming its solar panels aren't snapped off, it won't be until October that its batteries could charge enough for it to use its radio to attempt contact with Earth. 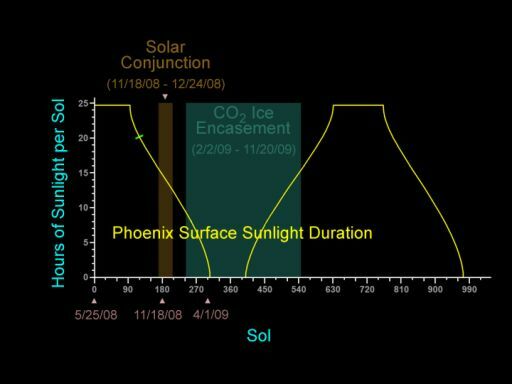 The yellow curve on this graph shows the number of hours of sunlight at Phoenix' landing site in Mars' norhtern plains. For the first 100-plus sols, there was sunlight around the clock. Now that the autumn is approaching, though, the Sun dips below the horizon for longer and longer each day; the green tick mark shows the situation on sol 123 of the mission, September 28, 2008, with darkness about 4 hours per sol. 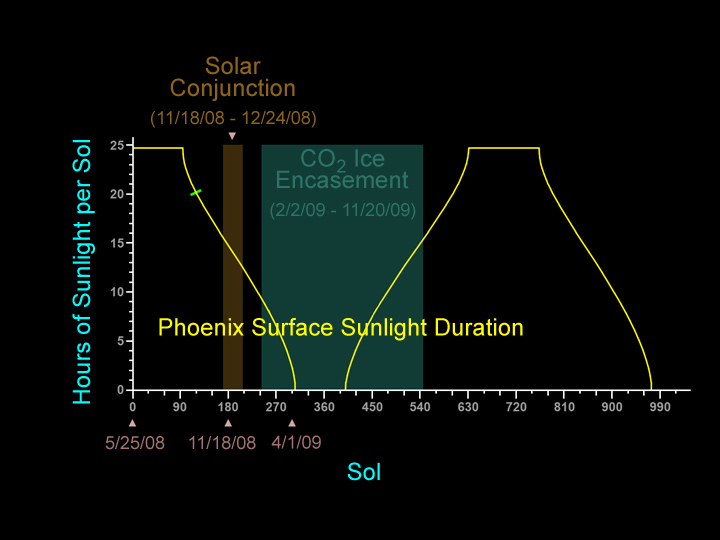 Decreasing sunlight means lower temperatures and less power; Phoenix is not expected to continue functioning past November 2008, through Mars' solar conjunction (marked in brown). With the arrival of autumn, the temperature will get cold enough that Mars' carbon dioxide atmosphere will freeze to the ground, encasing Phoenix in dry ice; the temperatures are cold enough to cause "glassification" and cracking of its circuit boards, most likely damaging the spacecraft too much for it to wake up in the spring. There was mention of an interest in turning on MARDI to see if it and its microphone still work, but evidently they haven't taken that step yet. I think the biggest news from today is the in-situ detection of calcium carbonate. If there was ever a period of standing water on Mars, then theory pretty much requires that carbonate rocks formed, since the atmosphere is full of carbon dioxide -- unless the water was all very acid. But detecting carbonates from space has been very difficult; only recently have the OMEGA and CRISM instruments on Mars Express and Mars Reconnaissance Orbiter started teasing out their signals from among the much stronger signals of other minerals. I've updated the Robotic Arm Camera images page and my sol-by-sol summary for the first time in several weeks (sorry about that hiatus). There have been some neat images lately. Here's my favorites -- a pair of vanity shots, two cameras on the lander taking photos of each other. On sol 116, Phoenix' mast-mounted and arm-mounted cameras captured vanity portraits of each other. This animation includes two images from the robotic arm camera of the mast-mounted camera, one facing the viewer and one with the head turned away. The mast-mounted camera (SSI) view of the robotic arm camera is even better, because the robotic arm camera flashed its LED lights as the images were being taken. On sol 116, Phoenix' mast-mounted and arm-mounted cameras captured vanity portraits of each other. This animation includes several photos of the robotic arm camera, which turned on sets of red, green, and blue LEDs as the mast-mounted camera watched. On TEGA, they've opened two more sets of doors, on ovens 2 and 6. Both of them opened in the worst kind of way, with just a tiny gap between the doors. Now only oven 3 is still shut. 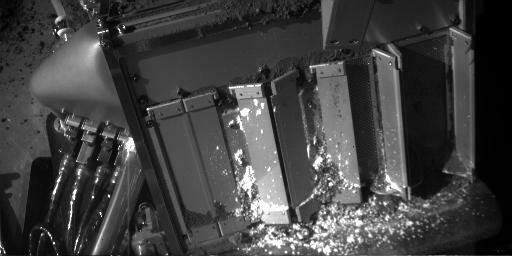 On sol 122 Phoenix scraped some material from its organic-free blank (to calibrate the TEGA instrument) and attempted delivery to the barely open doors of TEGA oven 2. As the scoop tilted to drop the fine, bright white material, the wind blew at least some of it away. The eight images in this animation were taken approximately 20 seconds apart, covering a span of about two minutes. Here's what TEGA looked like afterward -- what a mess!